We work with Toro Equipment who are a leading European company specialising in the design and manufacture of equipment for industrial and urban wastewater treatment, water processing, and water reuse. 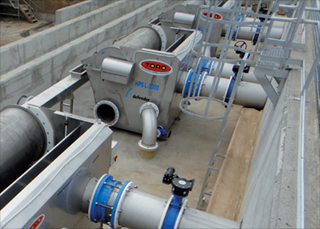 Designed to operate under the most difficult conditions, the Rotary sieves incorporate various feed points, overflow spillway, inlet purge, and specific application-dependent cleaning systems for waste water pre-treatment. Of course pre-treatment eliminates all large particles in order to protect subsequent stages from damage and obstructions.